If you are looking for siding that is durable, fire resistant, and unsusceptible to pests you may want to consider Hardie Board siding. Hardie Board siding has proved that it can handle damage from a huge rainstorm or windstorm. It is rot resistant and can withstand all kinds of weather. 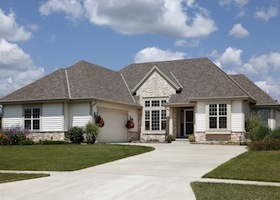 Fiber cement siding is created from a composite of cement, sand, and recycled wood fibers. This composite can create siding that looks like natural wood and is very aesthetically pleasing. Fiber cement siding is fade resistant and UV light resistant, so its colors remain brilliant for years to come.The most popular form of fiber cement siding used on American homes is Hardie Board siding from James Hardie. This type of siding has become so popular because of its reputation and durability. It is strong enough to protect your home from fires, hurricanes and the harsh hail storms we face. Along with being extremely durable, Hardie Board siding is considered “green and sustainable” making it great for your home and the environment. All Storm Solutions has helped many families install Hardie Board siding onto their homes. Our experts can walk you through the different types of Hardie Board sidings. We can help you choose the right style for you come. All Storm Solutions can answer any questions you may have about your siding. With our help and knowledge, you can get long lasting, sustainable siding for your home or property! Call us for more information on our Hardie Board siding installations.